Two more colors to go, and only a day left to cover them both! Next up is Green, which I think received a HUGE boost in power from. There aren’t too many cards that I think will be great to use in the sealed constructed format of the pre-release, but there will be a lot of green cards from Avacyn being used in Standard afterwards. Playing with a splash of another color? Use this! You mean I can tap for any color AND draw a card for one mana? Don’t mind if I do! If you grab one of those Angels but only want to play one of those colors, why not throw a few of these in the deck to cast it? Card advantage is always nice, and the any color ability can help if you are mana screwed. He does seem like a flasher to me. He's not wearing any pants. I kinda thought that the Briarpack Alpha was a good card cause it suddenly boosted your creature in play that was blocking, but in reality this is a much better card. 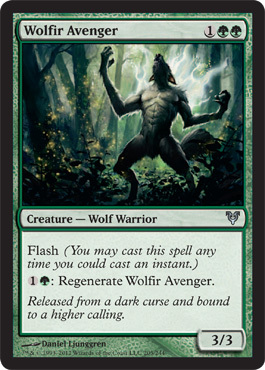 Great cost, and the ability to regenerate makes this one of the best, if not THE BEST uncommon in the set. It's kinda foggy- OMG WTF IS THAT?!?!? So your 1/1 death touch is going up a first striker or double striker . . . they think it’s an easy kill and WHAM! Suddenly your 1/1 is still alive and there is a huge corpse in front of you. I also like that you can go all in with your team, or block just one to kill it while everybody else survives. Kind of a selective Fog, which isn’t bad. For one more mana your Naturalize will net you 3 life! Definitely a sideboard card, but it’s not bad. I don’t think that the pre-release will be Enchantment heavy, but it’s good to have one or two of these around just in case. 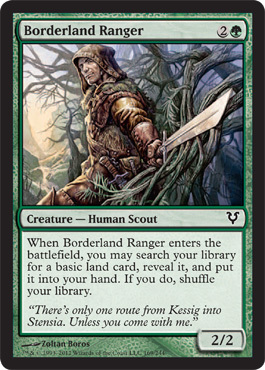 If you’re playing with a lot of creatures or need mana, this is a good card to have. 3rd turn seems just about right, but later in the game would be fine too if your board was just wiped clean by a Devastation Tide or Bonfire of the Damned. 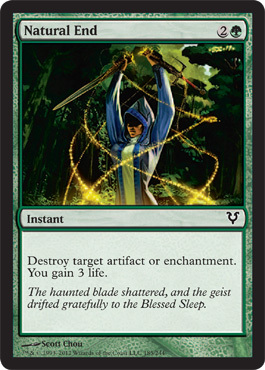 Green usually doesn’t have card advantage, but with an Abundant Growth and this in your deck, you could get to your big creatures rather quickly. It's no rampant growth, but it will do. 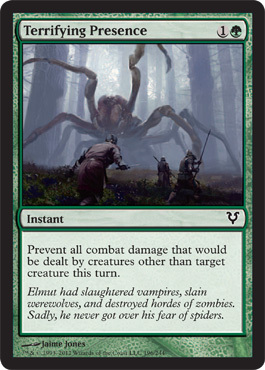 If you’re playing with some bigger creatures in your deck, you’ll definitely need a way to get to that mana quickly. He’s a little heavy at 3 mana, but if you need that 4th land by next turn for something in your hand, he’s good to have. 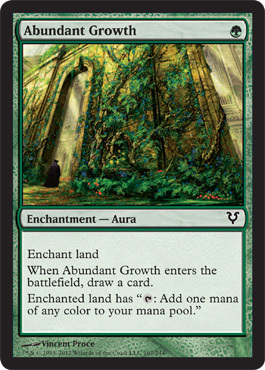 Playing with him, Abundant Growth, and Lair Delve will definitely get you land and creatures quickly. Might be worth playing green if you can get these cards. That wraps up the good commons and uncommons for Avacyn Restored. Of course there are a lot of other great green cards in the Avacyn set, but I don’t think their true potential will be unlocked until they are mixed in with cards in the the standard metagame. The next post will be the last “Tips” article, and will be featuring the White and Gold cards, which I think are the strongest in Avacyn. Be sure to check it out! Thanks for reading.